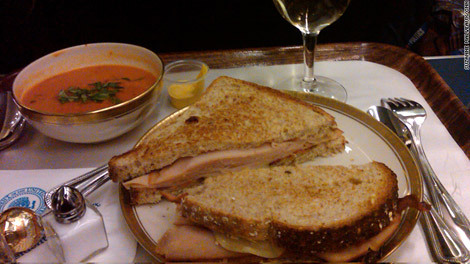 The food aboard Air Force One is "plentiful in quantity and broad in appeal," reports the NYT. We wonder how Michelle Obama feels about this. The food served on Air Force One sounds delicious—it’s the kind of comfort fare you crave when you’re under a large amount of stress, like the president might be. “It’s American fare, in that it’s not going all arugula on people,” President Obama’s former videographer, Arun Chaudhry, tells the New York Times. And like most chocolate fudge cakes, blue cheese burgers, fries, and buffalo wings (all featured on a 2012 Air Force One menu), it’s not particularly nutritious. While Air Force One’s food is held in high esteem by White House employees and reporters—because in no world is chocolate cake not amazing—the less-than-healthful food isn’t exactly in-line with First Lady Michelle Obama’s health and wellness initiatives. In 2011, Mrs. Obama unveiled MyPlate, the current nutritonal guidelines. Replacing the food pyramid, MyPlate recommends that fruits and vegetables make up half of meals, and that half of grains consumed should be whole grains. Her Let’s Move campaign against childhood obesity also aims to improve school lunches, emphasizing a cut-back on sugar, salt, and fat. However, Air Force One officials say that there’s always healthy food available like fruit, and they do their best to comply with Let’s Move standards. “They seem to be pretty well-rounded meals,” Jared Favole, a former reporter for The Wall Street Journal who covered Obama, told the Times. Favole’s favorite: yogurt and granola for breakfast. 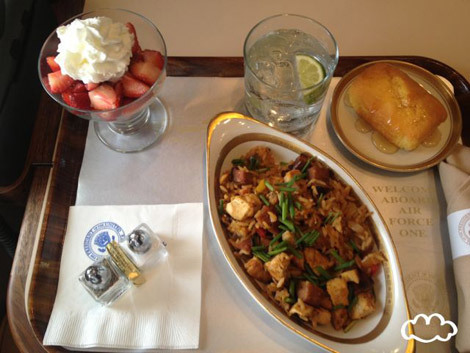 Of course, Air Force One’s food changes based on presidential preferences. George W. Bush favored meat and potatoes, and Ronald Reagan and his fellow passengers popped Jelly Beans during flights. The current president is not afraid to indulge in burgers or hit up Chipotle, so it’s not surprising Air Force One menus seem to have a balance of both good and not-so-good for you options. “He’s like the rest of us,” Chaudhry says to the Times. Well, kind of, except for the fact that he’s the president of the United States.